Note added 13-11-2011: visitors coming here through the link on Spaceweather.com, please read this story here first (click link) as there seem to be misunderstandings of what the video shows. I am behind with reporting my observation activities over the last two weeks. Hereby a quick report however on one part of the observations: the Lacrosse/Onyx 5 (05-016A) SAR satellite. Amongst the other Lacrosses (4 still in orbit, including Lacrosse 5) Lacrosse 5 is different in that it displays sudden and prominent brightness changes: from very bright (typically +1.5 or better) it goes to naked eye (near) invisibility, with a magnitude drop of at least some 3 magnitudes, in a matter of seconds. 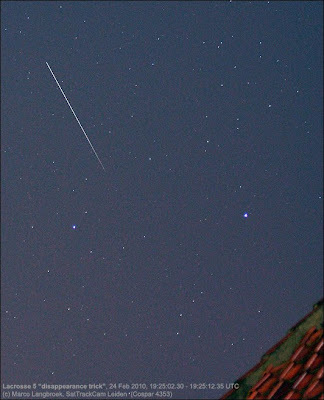 After that, it sometimes stays faint during the remainder of the pass: and sometimes it brightens up again after a while, sometimes followed by a second fading event. This behaviour was coined the "disappearance trick" by me a few years ago. Although the earlier Lacrosses show some brightness variation as well, none shows it so clearly as Lacrosse 5, meaning something in the design of this satellite is different from its predecessors. 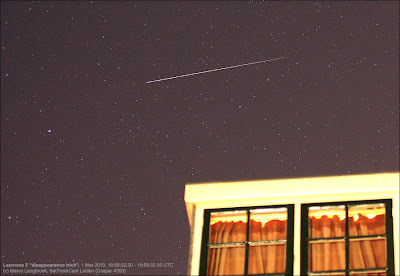 I have now been able to capture the satellite in the event of doing the "trick" three times: on 26 September 2009 during the BWGS meeting at Leo's place in Almere; and in the last two weeks on 24 February and 1 March 2010. The pictures and derived brightness profile of 26 September 2009 can be seen here: below are two pictures of the recent 24 February and 1 March observations. The captured 24 February occasion was a case of Lacrosse 5 re-appearing and then disappearing again for a second time during the same pass. I have combined the brightness profiles of all three events mentioned above into one comparison diagram. In all cases the curves are composites of 2 or 3 images taken during the pass in question (hence the non-continuous nature of the curves: the gaps are periods inbetween two pictures with no data recorded). The shown lines are 15-point averages to the pixel brightness along the trail. It is clear from this comparison that the character of the brightness drop is not the same on all occasions. The 26 September 2009 event for example is more steep and sudden than the more gradual 24 February 2010 event. The 26 September 2009 event on the other hand compares relatively well to the 1 March 2010 event, the latter being perhaps slightly less steep. Another thing notable is the suggestion of a omni-present brief shallow dip in brightness preceding the "disappearance" event by some 15 seconds (it can be seen near the 10 seconds mark in the diagram). It is still difficult to make sense of this all. What are we seeing here? Is it a matter of strongly differing reflectance properties of the satellite body with illumination angle? Is it some brightly reflecting appendage on the satellite disappearing from view? Is it a dark appendage on the satellite starting to block view of the illuminated satellite body, or casting a shadow on it? Is it due to some moving part of the satellite, e.g. a moving dish antenna? Phillip Masding has also probed the strange brightness behaviour of Lacrosse 5: his page with results is here and can be used as a comparison to the results I report above.